Pinback button for the Poor People's Campaign, ca. 1968, ink on paper on metal. 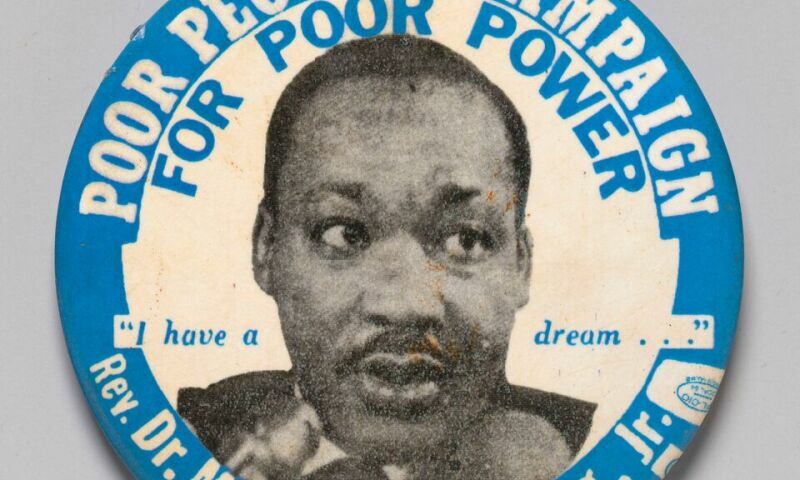 In 1968, Dr. Martin Luther King, Jr. and the Southern Christian Leadership Conference launched The Poor People's Campaign — a national, multiethnic, multicultural movement to demand equal access to economic opportunities and security for all people. As the United States emerged in the 1960s as a global model of wealth and democracy, an estimated 35 million Americans lived in poverty. From the elderly and underemployed to children and persons with disabilities, poverty affected people of every race, age, and region. Although President Lyndon B. Johnson had declared a “war on poverty” in 1964, social inequalities and unequal access to opportunities left many Americans struggling. In response, the Southern Christian Leadership Conference, led by Dr. Martin Luther King Jr. and Ralph David Abernathy, organized a Poor People’s Campaign to confront poverty as a national human rights issue. As a multiethnic movement, the six-week, live-in demonstration in Washington, D.C., attracted protesters nationwide to mark a new era in American history.